Posted June 27, 2008 in 2008/06, Odds & Ends, z Archive. As I warned previously, I am not going to be the one to break any news about Titan’s Simon & Kirby book projects. But the Jack Kirby Weblog has a post about some new information. Not much but it is better then nothing. Marvel Reprints or Marvel Recreations? 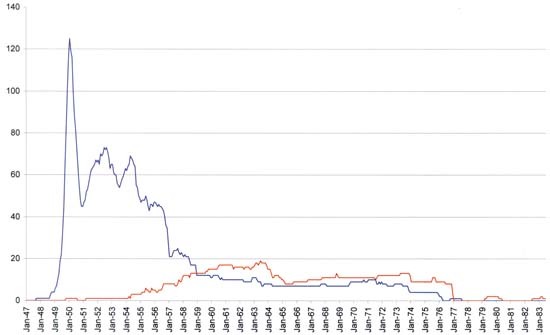 Dan Best has an interesting post on his blog 20th Century Danny Boy. It is Original Art Stories: Marvel Masterworks Non-Original Artists. 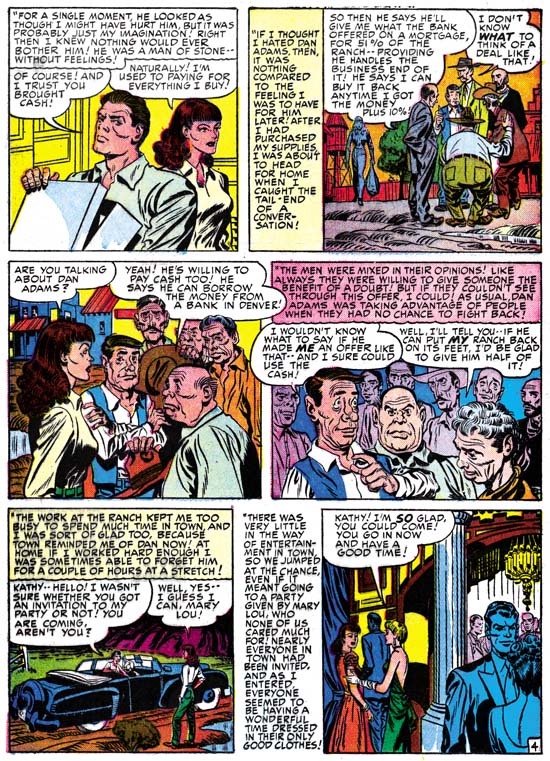 In it he discusses Marvel’s policy of re-creating art when the original stats are not available. It sounds like it is a lot more prevalent then I originally believed. I once wrote a post about Marvel’s reprint of the Human Torch #2 (1). In it I used the term re-inked, but in all honesty re-created is a more accurate description. Admittedly the original comics were printed with a very primitive type of press. I understand why Marvel would want to use stats when available rather then the original comics. But when original stats are not available the idea that a re-creation is superior to restoring from the original comics is just bizarre. Any re-creation no matter how skillfully done is always one artist’s interpretation of another’s work. This is true even if the original artist is used since so many years have passed. This can be misleading to any comic art historian trying to understand the style of the original penciler or inker. What is worse is Marvel does not even provide any indication as to what stories are based on stats and what are re-creations. Not only did Boys’ Ranch include exceptional pinups, the splash pages are among the best that Jack Kirby did and that is saying a lot. Most of them are full page splashes filled with excitement. 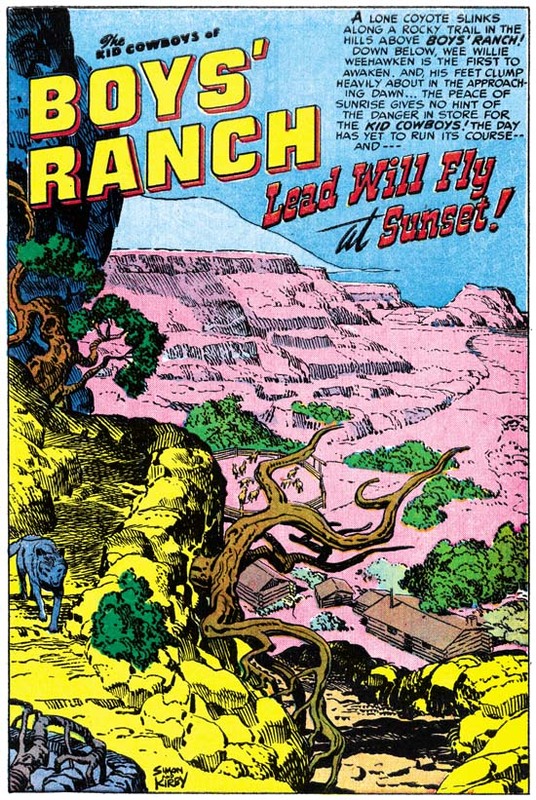 However the most unusual splash that Kirby did, not just for Boys’ Ranch but for any Simon and Kirby production, was certainly the one for “Lead Will Fly at Sunset.” Not only does it have no action, it does not even have any characters at all. That is Boys’ Ranch we see below from a distance but there is only the caption to confirm that. What we are provided with is nothing more then a landscape. Well that is a little misleading as this was drawn by Jack Kirby who shows here that he can embody a landscape with interest as well. Partly this is due to the unusual perspective Jack has depicted. In the foreground a steep trail descends to a panoramic vista. The nearby terrain is so rugged that only a few twisted trees have managed to cling to the rocks. With the extensive view it is easy to overlook the most significant inhabitant, a coyote on our left descending via the trail. But if a reader still wants to go back to my original post here is a link. 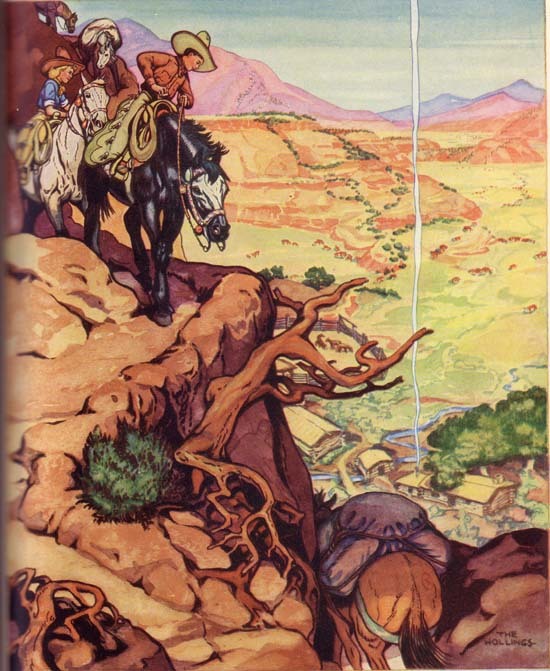 Part of the reason this may stand out is that Jack swiped this particular landscape from The Book of Cowboys by Holling C. Holling (published in 1936). and he kindly sent a scan of the landscape in question. Frankly I am not at all surprised that the splash was based on a swipe as it was so unusual. Further that fact that Kirby sometimes used swipes is now too well documented (mostly by Tom) to provide any shock. The equivalent of swiping is a fundamental process in art but only comic art fans use such a derogatory term (swipe is slang for steal). I hasten to add that I believe Tom uses the term for the same reason that I do; the word is so entrenched with comic book fans and requires no explanation. Personally I find cases such as this not a source of embarrassment or condemnation, but as valuable windows into the mind of the creator. Despite my having referred to it as a swipe the splash is truly a Kirby creation and not a mere copy. Compare any detail and it will be seen that Kirby has not followed Holling’s closely. For instance Kirby has only kept one of the distant mountains and even that has been rendered in a manner suggesting that it may be a cloud. This has the effect of making the closer bluffs more dramatic then in Holling’s illustration. Also Kirby has added clumps of trees in the background in places that Holling had left rather featureless. Although I was not surprised that Kirby swiped this splash I would never have guessed the most important change that Jack made. The most unusual aspect of the comic splash, particularly for an artist like Kirby, was the complete absence of people. It would never have occurred to me that this would not also be found in the original source of the swipe. Yet Holling has foreground figures descending the trail. The most natural expectation would have been that Jack would replace Holling’s figures with Boys’ Ranch members. Unexpectedly Kirby removed Holling’s figures entirely and introduced the lone coyote in their place. It is one of those creative leaps of a great artist that provide awe but can never be truly understood. It seems counter-intuitive, but the removal of all people has made the splash more dramatic. That the Boys’ Ranch splash was now been shown by Tom Morehouse to be based on a swipe does not diminish it in my eyes. Quite the contrary, seeing how Kirby has used Holling’s book illustration has increased my appreciation for the splash. I may use the term swipe but in reality Jack has not stolen anything. Sky Masters Color Guide, Kirby Kolors? Ferran Delgado, who as I previously mentioned is working on a Spanish reprint of Sky Masters of the Space Force, has posted an image of a Sky Masters color guide on his blog. There is every reason to believe Jack Kirby did the coloring for the Sky Masters Sunday strips. Therefore the Sunday strips may be the only source to be able to come to a true understanding of Kirby Kolors. It is particularly nice to see an example of the actual color guide. I cannot wait for the final volume (containing the Sundays) of the Spanish Sky Masters reprints to come out. The Art of Romance, Chapter 8, Kirby on the Range? The theme of this chapter is one that I have touched on before in relationship to some work from Young Romance. Rather then repeat myself over and over again in the examples below I will summarize my argument here. There are five basic ways that some story art might have an incomplete resemblance Jack Kirby’s work; the art may have been done by an artist that was influenced by Kirby; the artist may have swiped from Kirby; Kirby acting as an art editor may have altered another artist’s work; the inker may have deviated from the original pencils by Kirby; or Kirby did layouts that were finished by another penciler/inker. The first three can easily be distinguished from the other two by not being consistently present throughout the story. However distinguishing between the effects of a heavy handed inker or an artist working from Kirby layouts presents more of a problem. In the end it is a judgment call which is probably based in part on how the person making the call feels about the way inkers at the time went about their work. If you believe that inkers working for Simon and Kirby felt that they should impart their own vision on Kirby’s pencils (such as certainly was the case in the silver age) then you are likely attribute stories that do not look like typical Kirby to a heavy handed inker. If, like me, you doubt that an inker would take liberties on tight pencils provided by Kirby (who after all was their boss) then untypical Kirby stories would be better explained as due to an artist working from Kirby layouts. The difference between the two possibilities really is not that great because in these cases the second artist appears to have been the inker as well. Nonetheless I like to make the distinction because there really does seem to be two bodies of work. One group of work is easily identified as by Jack Kirby with all of his characteristic traits no matter who did the inking (the unadulterated Kirby). The other may not always be so readily identified and has unusual traits (unusual at least for Kirby). I remember that during the silver age Kirby was sometimes listed as having provided layouts while another artist would get the credit for the penciling or finishing. I believe this is just as unfair as the credit Jack sometimes got for plotting while another (Stan Lee) would be credit with the writing. Plotting a story would normally be considered part of writing it just as laying out a story would generally be included in the drawing of a story. Separating plotting from writing or layouts from pencils is fundamentally unfair. In Jack Kirby’s case it is particularly egregious because some of his margin notes ended up in actual dialog and also some of his layouts would be quite tightly rendered in places. Therefore in cases where Jack provided layouts I prefer to credit the pencils to both Jack and the other artist. Unfortunately I have never been able to identify who the finishing artists were. 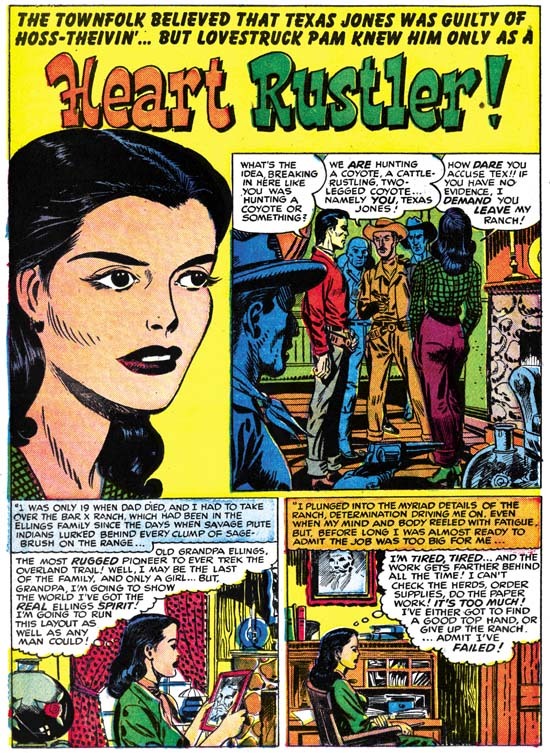 The Jack Kirby Checklist cites “Heart Rustler” as being inked, but not penciled, by Jack Kirby. 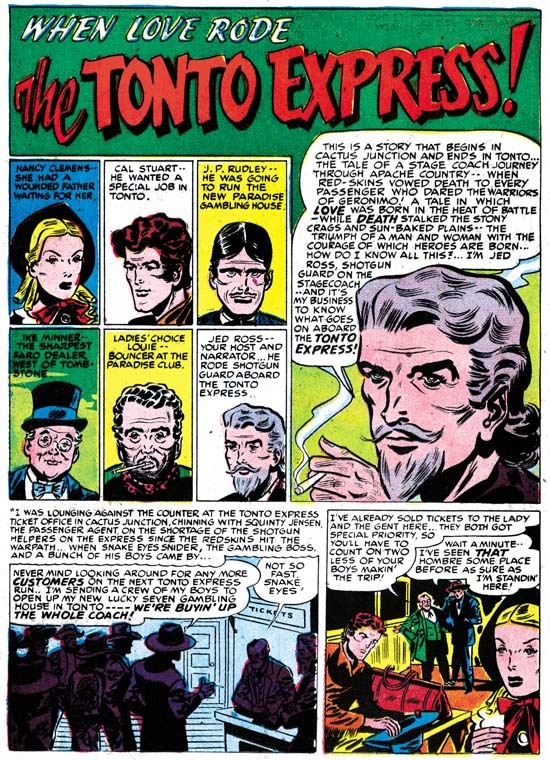 Simon and Kirby’s business was not so much creating comic books as producing them. So it is easy to imagine circumstances where Jack Kirby could be called on to ink someone else’s pencils. I do not know about the reader, but I would love to see how Kirby would ink another artist. So I look at stories like “Heart Rustler” with much interest. However when I examined this story I was disappointed, it was clearly not inked by Jack. Yes there are some places that exhibit some features of Studio style inking. There are some abstract shadows in each panel that are created using a very blunt brush (see my Inking Glossary for explanations of the terms I use to describe inking techniques). Those in the splash panel and first story panel could even be described as having an arced edge. It is probable that Jack or Joe added them. More important are the spotting that is done in a way that Kirby would not have done it. The man blocked out in blue on the left edge of the splash panel has a hat casting a shadow formed by simple hatching; I have never seen Kirby do that. It may be a little hard to make out in the image I supplied but the lower legs of the woman in the same splash panel are shadowed with nearly vertical lines; again this is not an inking technique that Jack used. None of the clothing folds look like Jack’s brush. In fact the shoulder of the woman in the first story panel has a couple of odd blunt spots; one of which is attached to a then line as if it was a leaf on a drooping stem. 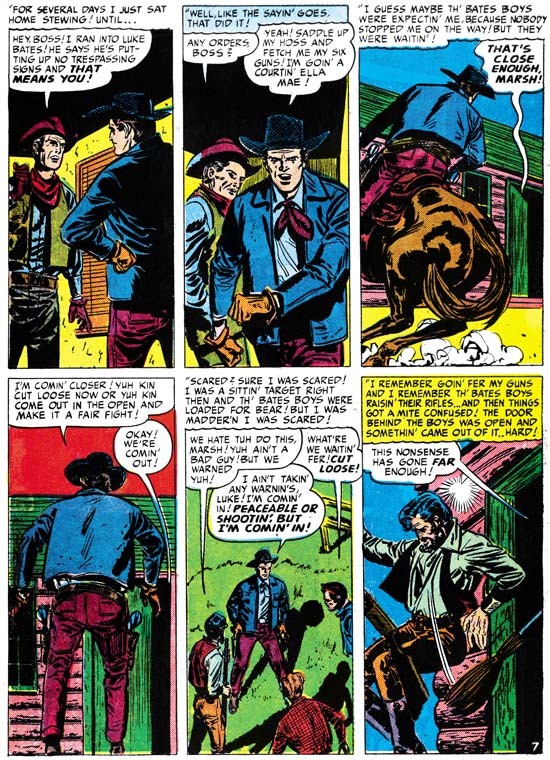 Kirby would sometimes use similar blots on the edge of a limb as a way of indicating a shadow but he never placed them isolated as done by this inker. Similar problems can be found throughout the story. So I repeat Jack Kirby did not ink this story other then some possible touch ups. Was the attribution found in the Jack Kirby Checklist just completely unreasonable? No, I think I can understand how it came to be. Look at the face of the woman in the splash. She seems to me to have a very Kirby look to her. Kirby’s hand is a bit harder to see on the rest of the page although I feel it can be seen in the armed gunman in the splash panel. I also believe I can spot Kirby’s touch in the other pages of the story. Further the entire story seems to be laid out in a manner typical for Jack Kirby. I suspect that source of the inking attribution in the Jack Kirby Checklist noted the Kirby look to the story and assumed that it was achieved by Jack inking the piece. Since the brush work itself shows that Kirby was not the inker another explanation must be advanced. The explanation I would give is that Kirby did the layouts for this story. It is apparent that when Jack did layouts the pencils would be tighter in some parts (like the face of the woman in the splash) while other places it would be rougher. Another artist would then tighten up the work and then ink it or perhaps tighten it up while inking. 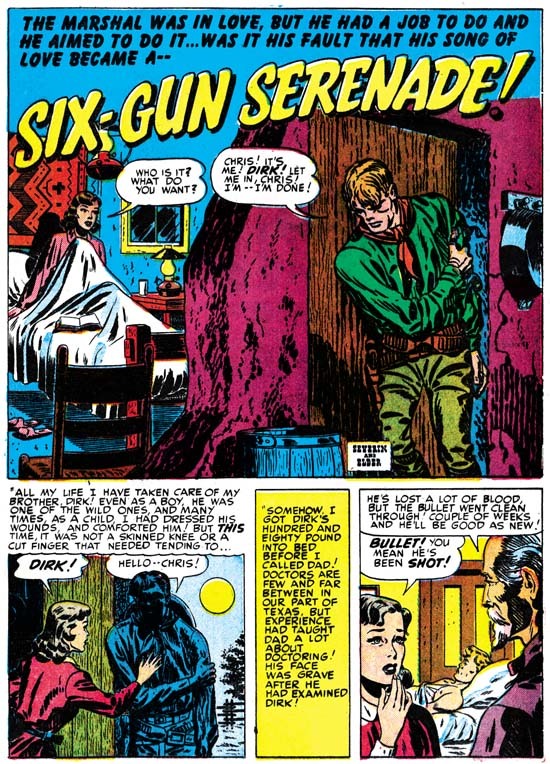 Another story identified by the Jack Kirby Checklist as inked but not drawn by Jack Kirby is “Our Love Wore Six-Guns”. Here is a case where the inking is actually done in a manner even further from that used by Kirby then in “Heart Rustler”. Nothing looks like Studio style inking. The clothing folds are typically long and narrow very unlike what Jack was doing at this time. 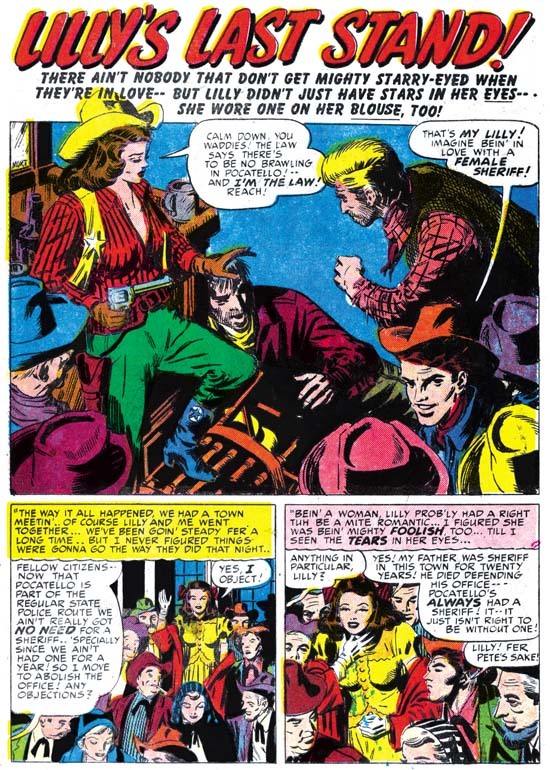 It may be less obvious in “Our Love Wore Six-Guns” then in “Heart Rustler” but there are some faces that look like they had the Kirby touch; for instance the woman in the page’s last panel. These Kirby-like portions occur too frequently throughout the story to be explained as either swiping by the artist or art editing by Jack. The man is just as consistently un-Kirby like in my opinion. I find it hard to believe that an inker would have produced the man’s face in this way had he been inking over tight pencils by Jack. The story layout does seem to have consistently been done in a way appropriate for Kirby. So my conclusion is once again Jack provided layouts and another artist finished and inked them. The inking style used in this story does not match that for “Heart Rustler” so I believe different artists were used for the two stories. To be honest I am not very impressed with either of the two artists who worked on the Kirby layouts for the two stories I discussed above. Because of the low quality of the work usually found on Kirby layouts, I believe the layouts were generally provided when Simon and Kirby felt it was necessary to employ the use of artists of lesser talent, perhaps even studio assistants. However there are exceptions such as “Kathy and the Merchant”. The group of men in panels 2 to 4 is, in my opinion, nicely done. I also do not think their higher quality was due to tighter pencils. To my eyes they have a blend of Kirby and non-Kirby elements. Page 4 is typical of the story so swiping or editing can be eliminated as explanations. I can understand if others believe that Jack did the pencils that were just inked by another, but I prefer to think that Jack supplied layouts not tight pencils. I will say that the Jack Kirby Checklist credits Joe Simon with the inking but I feel that is clearly wrong. The brushwork is much too fine in this story to be the work of Joe. 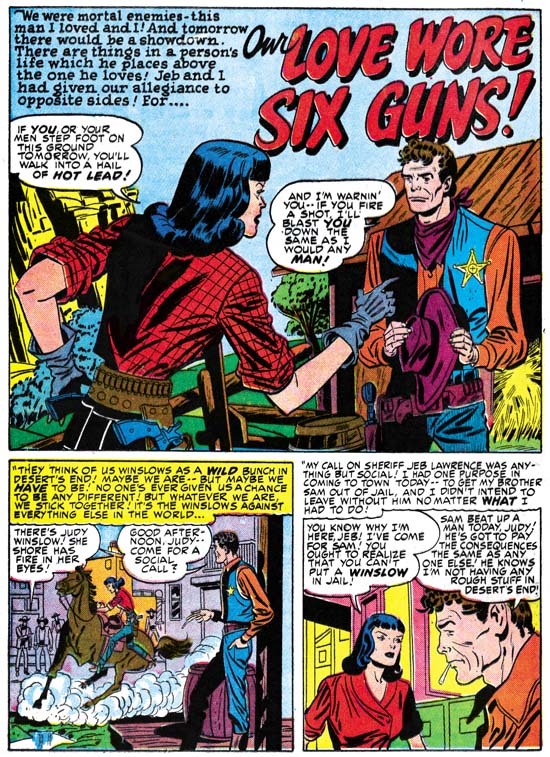 I think “Perfect Cowboy” also falls into the category of Kirby layouts. The splash may have been particularly tighter and was not inked by the same artist as the rest of the story. The story inking is very interesting. At a glance it appears to be Studio style brushwork. Certainly that was what the inker was attempting. But this is not Joe Simon’s inking as suggested by some. The picket fence crosshatching only superficially resembles Jack or Joe’s brush. The pickets have a distinct pointed end and progressively widen through most of their length unlike the more uniform width found in Kirby, Simon or even Meskin’s use of the Studio style. I am not sure I would call it true picket fence, but simple crosshatching is applied to the dust cloud in panel 3 which is unlike anything I have seen by an inker working in the Studio style. 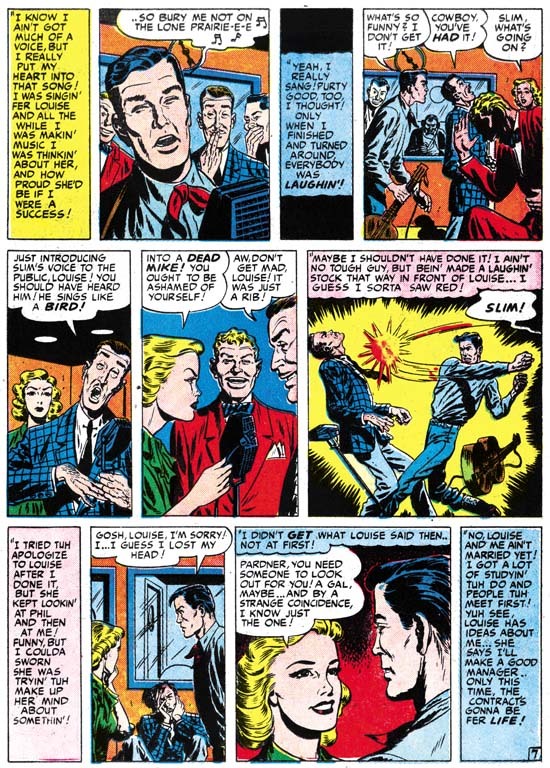 However the most unique technique of this inker is his applying of picket fence crosshatching to the hair of the woman as best seen in the last two panels of this page. The pickets are placed in the same direction as would be expected for the hair and therefore the rails are at odds to the flow of the hair. This is all meant to suggest shadows formed on the lower parts of the waves and curls but the result is decidedly unnatural looking. I do not remember seeing this spotting of hair ever being repeated in Simon and Kirby productions. The final story that I will cover is a tough call. 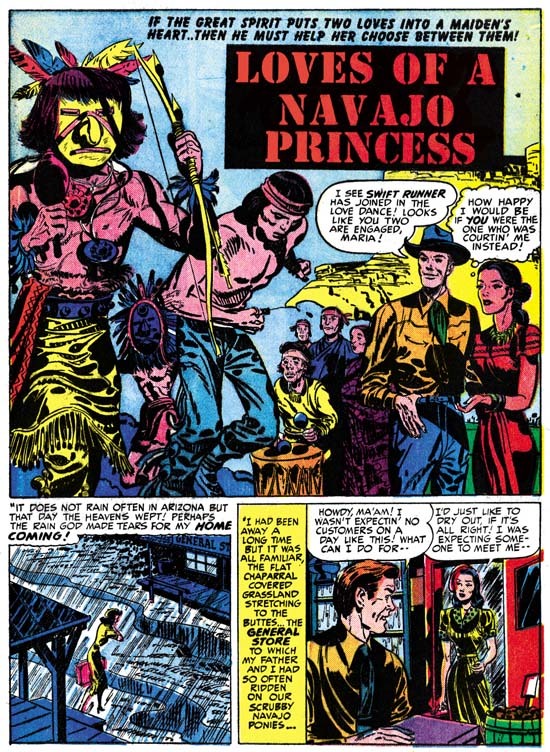 The two Indians in the splash panel were clearly done by Jack Kirby. The Studio style inking that the left part of the panel shows almost convinced me that this was an example of Jack as art editor fixing up the splash. However close examination showed that the same inking style was used on the rest of the splash. Actually the entire story is done in Studio style inking; picket fence crosshatching, drop strings, abstract arc shadows, the works. In fact the inking job is truly well done but it just does not look like Kirby’s brush. The biggest giveaway is the cloth folds which have a distinct tendency for elongated folds in some places and irregular blots in others. Nowhere else does the art look quite as pure Kirby as the splash but there are more then enough places that have Jack’s touch to convince me that it was his layouts. But like I said it is a tough call and I am not sure many will agree with me, certainly the Jack Kirby Checklist does not. 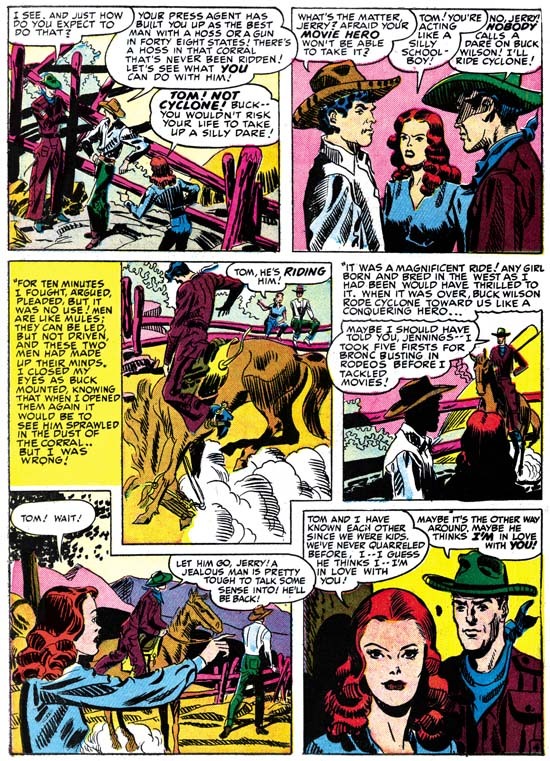 This chapter concludes the western romance section of The Art of Romance. I have added to my sidebar checklists for Real West Romance and Western Love. Cowboy love was an interesting experiment but it just was not a very successful one. 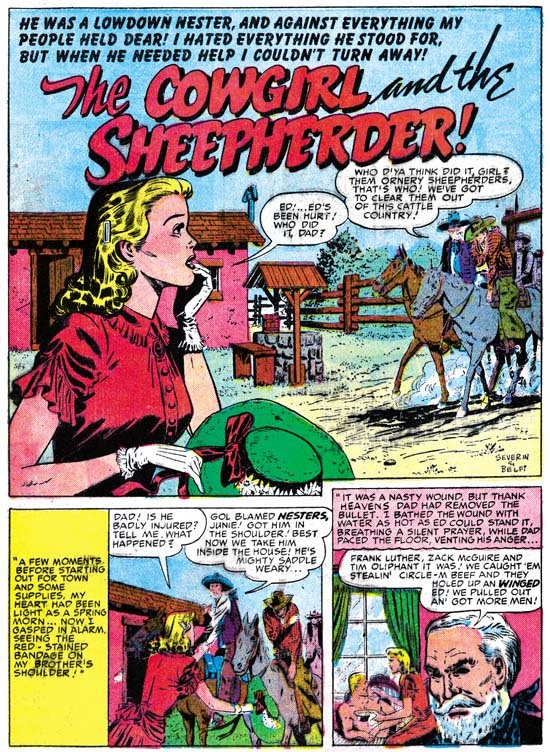 The love glut resulted in the cancellation of a lot of romance comics including the western subgenre. However it would not be correct to blame the demise of the western romance on the love glut. Despite all the cancelled love titles there must have been enough profits during the love glut to convince at least the major publishers to continue to produce a significant number of titles. In contrast none of the publishers decided to continue the western romance titles. 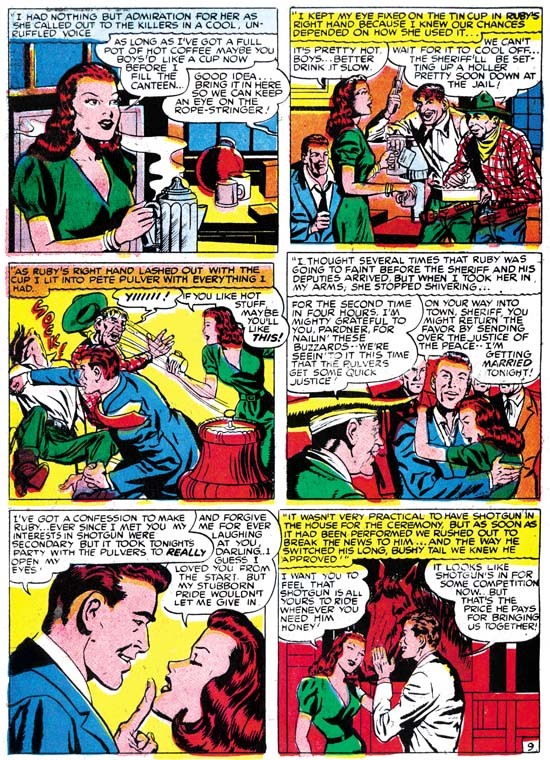 The effects of the love glut on the romances that Simon and Kirby produced for Prize was very divergent. Real West Romance and Western Love must not have sold well as they were cancelled just after the peak of the love glut. Young Romance and Young Love not only seemed to weather the love glut but to flourish. But that will be discussed in future chapters of The Art of Romance. Posted June 8, 2008 in 2008/06, Odds & Ends, Topic, z Archive. I am in a funny situation. Since I am involved in the Titan book deal you would think this blog would be a great source for all sorts of information about the project. Actually that is far from the case. For instance I was scooped on the Titan press release. Not only that but one investigator reported on the deal months ago (and no I will not say who he was and how he did it). It is not that I do not know what is going on. Often I do (however not always) but it is not my position to pass that information along. All news about this project has come from Titan in the past that will continue to be the case in the future. I will pass information along only when it becomes official. I suspect that this blog will not be the first to report project news. Some people have offered various types of help. It is certainly gratifying to see how willing people are to further not just this project but any that is related to Jack Kirby and Joe Simon. Unfortunately I cannot respond to those offers, at least now. Although I cannot talk much about the project I do not think it would be wrong for me to comment about the people. I am greatly pleased about the commitment I have seen. Titan wants these volumes to be as good as possible. I do not think fans will be pleased with the books when they are released, I think they will be thrilled. I believe that is what everyone on this projects wants. Let me wrap this up by expanding my subject matter beyond the Titan book project and talk a bit about recognition. In the past Jack Kirby did not get the credit that he should have. Sure Kirby fans knew how important Jack was, but the public at large did not have a clue. You would have thought that the blockbuster movies based on characters Kirby co-created would have changed the public’s perception (or more accurately lack thereof). But it did not happen. I think that now it is changing and I credit Mark Evanier’s book “Jack Kirby: King of Comics” with being pivotal for that change. However Jack Kirby was not the only one who did not get the recognition that he deserved, Joe Simon did not get the proper credit either. This was particularly depressing to me because some of this neglect originated from people who should have known better. The general attitude was that in the Simon and Kirby collaboration all the art tasks were handled by Jack and Joe only did the business end and some inking. I feel that this is changing as well. More and more I am hearing comments about Joe’s importance. I wish I could say that this blog was instrumental to this change but I know that simply is not the case. My readership is much too small for my efforts to have been the cause. If I am right about the shift in recognition for both Jack Kirby and Joe Simon, the future should be very exciting times for their fans. In Chapter 6 of “The Art of Romance” I presented a graph of romance titles that vividly depicted what Michelle Nolan described in her book “Love on the Racks” as the love glut. 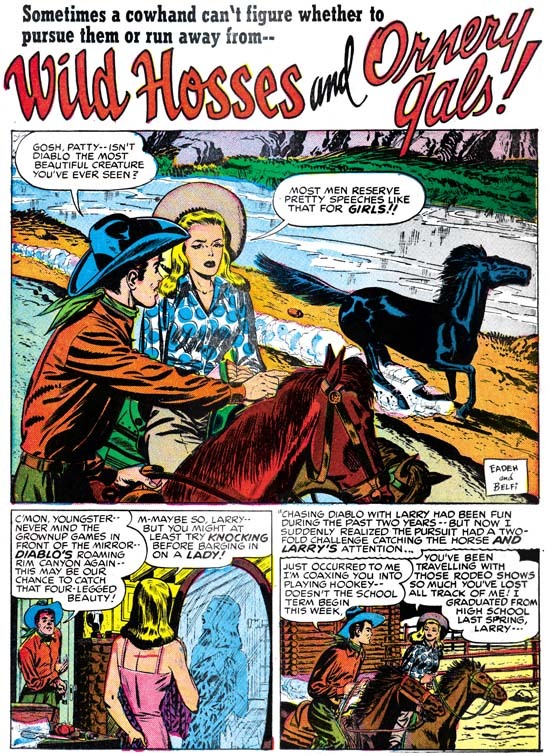 I mentioned that the two greatest participators in this rush to produce romance comics were Timely and Fox Comics. 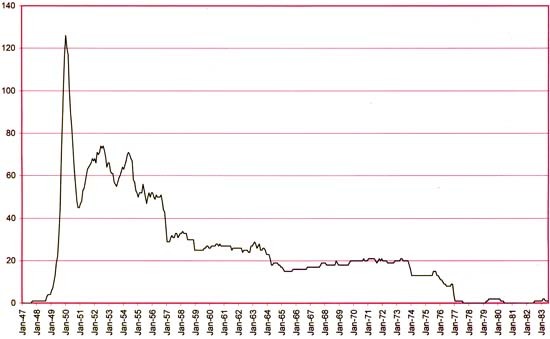 The reward received by Fox Comics for their zealous jump into love comics seems to have been the bankruptcy that terminated the company a few months afterwards. Timely obviously survived, but I wondered if more could be determined about what effect the love glut had on them? This time I turned to Atlas Tales (what a great site). I used their search engine to provide all the titles between August 1948 and June 1951. I then entered that information into a database and segregated the titles to romance and non-romance. 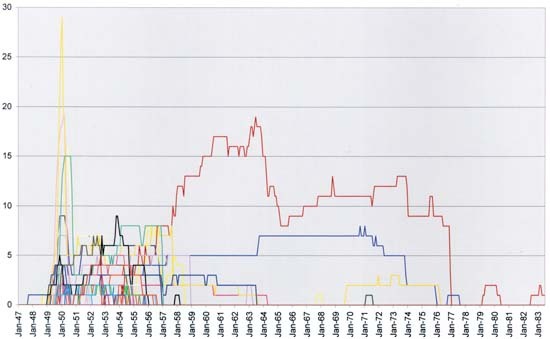 Chart of Timely Titles (Romance titles in blue, non-Romance titles in red, and the combined titles in black). 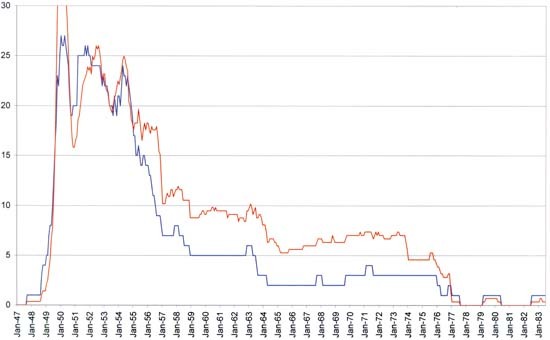 The resulting graph is not perfectly smooth but it still is revealing. It looks to me that when romance titles were first introduced they took the place of other genre comics as shown by the small dip. However the non-romance genres quickly recovered to their pre-romance levels while more and more romance titles were added. Finally a maximum of 24 romance titles were reached, just 3 titles short of all the other genres combined. This was followed by the crash. Now the cancellation of romance titles is expected but note that the non-romance titles also dipped in February 1950. 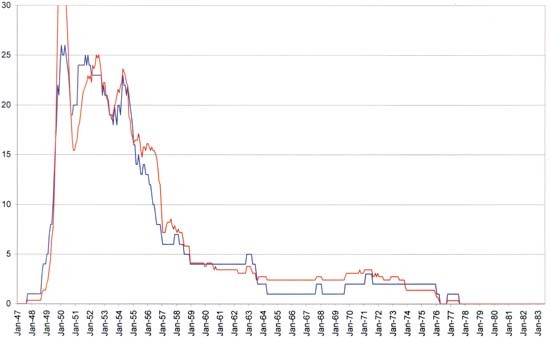 This suggests that the glut resulted in enough of a financial loss that it impacted other titles as well. As I mentioned in Chapter 6 a low of romance titles was achieved in November of 1950 after which the number of romance titles began to climb although never reaching anything near the levels at the peak of the glut. Timely did not participate in this resurgence and instead maintained a steady level of 6 romance titles for the period covered. 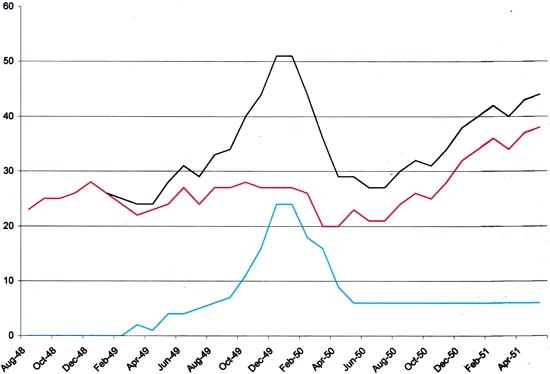 The non-romance Timely titles quickly returned to their pre-glut levels (by September 1950) and then continued to levels even higher then before the glut. Whatever financial loss Timely suffered was short lived. I wondered if the even higher levels that Timely achieved after the love glut could have been at the expense of other publishers, like Fox, who were not able to recover so quickly? Posted June 7, 2008 in 2008/06, Odds & Ends, Topic, z Archive. I have recently obtained a copy of “Sky Masters of the Space Force” Libro 1. This is the first of what should become a three volume set. The restoration of the newspaper strips were made by Ferran Delgado, who has his own blog. I am of the habit of periodically visiting his blog just to look at the beautiful images of comic art that he provides. Unfortunately I have a serious problem with his blog and this “Sky Masters” book as well, no hablo Espanol. I took three years of Spanish in high school but I am afraid I passed only because I was the quietest person in the class. Still I am particularly looking forward to the volume containing the Sky Master Sunday strips. Ferran has posted some of his restorations and one of them has also appeared in Mark Evanier’s “Jack Kirby: King of Comics”. These restorations are nothing short of drop dead gorgeous. Ferran is taking great care to faithfully restore the original colors of the printed version. Readers of my blog should not be surprised to find that I feel recoloring was one of the greatest banes of earlier reprints of material drawn by Jack Kirby. This particularly egregious in the case of Sky Master because there is every reason to believe that Kirby did the original color guides himself. It is much more likely that work done for the Sky Master in the late fifties could lead an understanding of the true nature of Kirby Kolors then any of the work that Jack did in the ’80s or ’90s. So congratulations to Ferran Delgado for successfully bringing the first volume of Sky Masters to print. I know it required a lot of work, but the result certainly justifies the effort.